I would like to share with you some flashcards vocabulary activities that I often use to introduce, practice or revise lexical sets. For my primary students it is the best way to recognize and memorize new words. 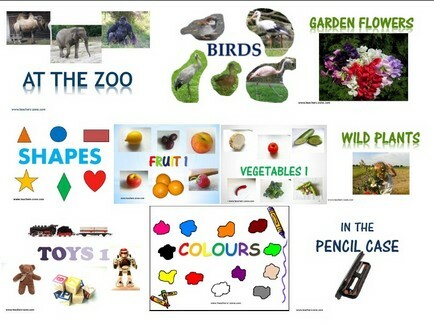 These activites are possible to use even in big classes, involve a whole group, are easy to prepare (the only thing you need is a set of pictures that represent vocabulary you would like to teach)and children have a great fun. A set of flashcards is sticked on the board and children say the words or repeat them after a teacher. Then ask the children to close their eyes and remove one or two of the flashcards. Children open their eyes and name missing flashcards. A set of flashcards is sticked in a row on the board. Children say or repeat the pointed words. Then remove the flashcards one by one and the children name the pictures as if they were still on the board. Take a set of flashcards that you introduce before, mouth one of the words silently and the students try to guess the word. Show a flashcard and say the word or sentence. If you say the correct word (sentence), students repeat it. If not, they stay silent. Ask one student to mime the word from the picture and the rest of the class try to guess. Who guess correctly mimes the next flashcard. This activity is a great way to teach asking questions and giving short answers – students from the class ask questions and a student in front of the class answers. Divide the class into 2-4 groups and ask them to sit down. Put a set of 3-6 flashcards in front of each group. Say the words one by one and the right group of students stands up for a moment and sits down again. All flashcards you can download for free from my website and print them.